It’s not as much a spirit of web reclaiming as much as a preference for writing on the web that this my primary space. But is is a spirt of the way I like to understand web technology to try stuff. So much later than most, a few weeks ago I gave the writing environment of medium a try. I decided to take something I had written five years ago, and do it as a rewrite. The lead image becomes the title page, and the small amount of text on the main screen makes you think about the lead in to the story. 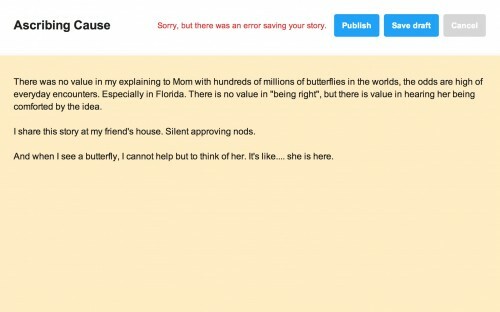 I took the original opening to my story, and found it tried to explain to much, plus there was no strong pull. SO I cut it way down. Went lean. Each time you start a new paragraph, you have have an option to add media- images, video, or anything else with an embed- again, with a minimal tool thing that disappears. You can make the images be in line with the text, or spread across the page (hello parallax) and even with an overlay of text. Unlike most systems, there is not a compose/preview/compose/preview cycle — you see it all as you write. I was liking it. Two hours went by, and I found myself doing a lot of re-writing to what feels now like awkward and uneven writing (the original was a blog post). There was an image I decided to change, and I selected it, clicked the delete key. I recall some sort of dialog box, confirming flying by (and I was feeling tired), but next thing I was back on the medium home page. Everything was GONE. I tried undo, back page clicking. Last week, I had a curious incident prompt me for a story. I was feeling done with medium, and decided to give it a go in Cowbird because I saw it as a rich mixture of image and text. I’ve written maybe 130 pieces there (another half done project sites there half done). 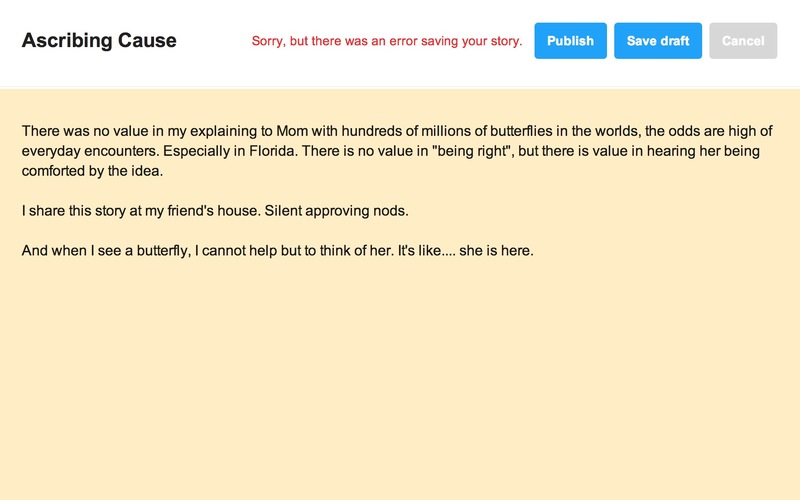 Sorry, but there was an error saving your story. Sorry? Sorry? WTF? What kind of error? How helpful is that? I read the FAQ, it said to copy the text of the story, and try a new one. Now with medium and cowbird piling on me, I am wondering WHY THE _________ I WOULD WRITE ANYTHING ON A THRDY PARTY SITE. I am 0 / 2. How about these for hints. Google Reader. Posterous. Pownce. Orkut. xtranorml. Jumpcut. I could have done both of these stories right here. I got a faint reply from medium asking if I checked my history. History? I was thinking that since I never saved there was no history. Then I heard from cowbird that they got my message and were looking into it. And yesterday, just out of curiosity, I wen back to medium, and had never noticed the slide out menu on the left, when you click the logo. There was an item called “Drafts”. I clicked. And there was my draft. All of it. Damn. PEBKAC. And I am up to 1 / 2. Then I got an email from Bryan Alexander asking why I posted the same story to cowbird three times. How was that? The site said there was an error saving. I went to cowbird and checked. Indeed, there were three copies of my story in the published pile. But all of them were missing the four photos I had added. So I deleted two of them, and re-edited the remaining one to add back the photos. Save. So I let it lie. For 2 days. And today, I was able to re-insert my images, and save the cowbird story. Bingo!, 2 / 2. After all, that.. what about the **##$ stories? Of course. Aloneness / Loneliness, published on medium recaps my experience spending a month in Iceland in 2008, alone dog/house sitting, but pretty isolated. It was originally written in November 2008 as a caption to a flickr photo. Note: This is not an embed of my story; it is an embed of a graphic link to my story. Bad medium. The shape of it is the same, but I did a lot of rewording, introduced a few more elements (and photos), and mostly moved from describing a series of events with a tad of reflection to being much more reflective (I hope so). The process of re-writing was illuminating; I had a chance to look back on the experience with a lot more life gone by. And I can see un doing this how much my writing style has changed (except for the typos, that is consistent). The second story, now published in cowbird, is Ascribing Cause. This came from a night last week when a cabinet in my kitchen spontaneously fell from the wall and smashed my dishes to tiny shards. I had been standing right in front of it a few minutes earlier– and cannot recall exactly what compelled me to move. Note: This does embed the cowbird in vertical scrolling form. Cowbird trumps medium in this department. In the time since I wrote it and thought it gone, and returning back, I re-edited a lot of the dialogue and tried to move away from cliche phrases. Again, having the time to re-compose makes the story much better. Is this where I say something about all being well / ending well? There are features I like in both writing environments. And I have a back struggle with the idea of my story being elsewhere. My blog is in its 11th year and there is no reason to worry about it not being there in the future. These other services? Could be gone in a snap. But I also had a chance here to rework a story a few times, and can see how much more work I could have done there. Now that story of two mediums was instructional. I am always thrashing through stuff like that, and it is perversely reassuring to know someone far ahead of me on the tech scale still thrashes, too. When I got to the rodeo grounds, my transitional lenses made it almost impossible to see the camera viewscreen. When I got home, I had turned the camera OFF every time I thought I turned it ON and vice versa equals NO footage after two hours of 90 degree rodeo dust. Sigh. 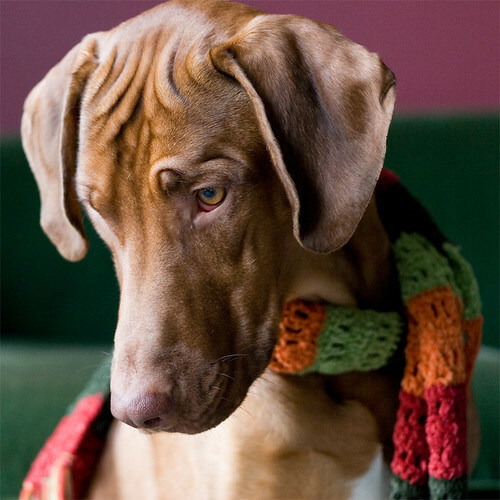 All versions of Murphey’s sad and inevitable law. At least you got your stories back and added this one to your game bag…O frabjous day!